Produce a creative artefact which represents my unique design practice. Mixed Messages is a project born from a mixture of interests in design, strategy and copywriting. 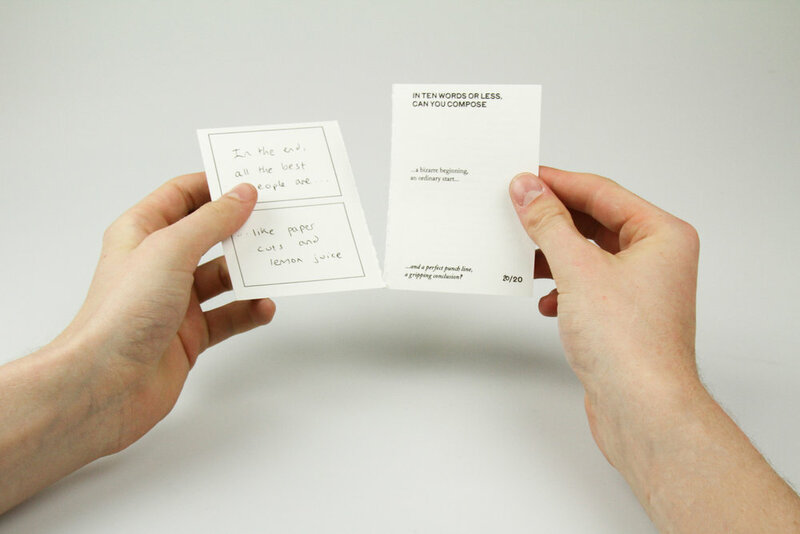 The artefact: a set of interactive postcards which ask creatives to blindly collaborate with someone else through two short pieces of creative writing. This collaborative project is based on the old surrealist writing and drawing game Cadavre exquis (exquisite corpse). The project: Mixed Messages takes the aftermath of these responses and combines them in a series of nonsensical narratives. Two pieces of copy are requested from the addressee, each in ten words or less: first the beginning of a sentence, and second, an end (see example combination of sentences on postcard). Each addressee will write their piece, tear the postcard in half and send it back. Note: Responses are still being collected but will soon be collated into a design response.